Why make plain old gravy when you could treat your chicken breasts—or any meat or rice dish, really—to this sweet and spicy Creamy Pumpkin Mole? Heat small saucepan on medium heat. Add ancho pepper; cook 2 min. on each side or until color changes. Remove from heat; let cool. Shake out seeds. Place pepper in boiling water. Let stand 20 min. or until pepper hydrates and softens; drain. Place pepper and remaining ingredients in blender container; cover. Blend until smooth. Pour into small saucepan. Cook on low heat, stirring constantly, until mixture comes to soft boil. Spoon over cooked meat or rice or in tamales. 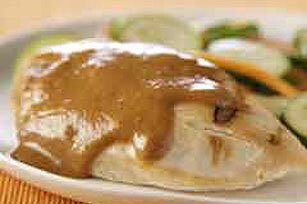 Pumpkin Mole can be made ahead and refrigerated for up to 3 days. For longer storage, place in resealable plastic container and freeze. Makes 14 servings, 2 Tbsp. each (about 1-3/4 cups).